Prepare for your growing bump, labour & baby! Which is heavier? - the weights or the baby? Pelvic floor workout & smiling - that's multitasking! Pregnancy challenge - the real challenge is yet to come! 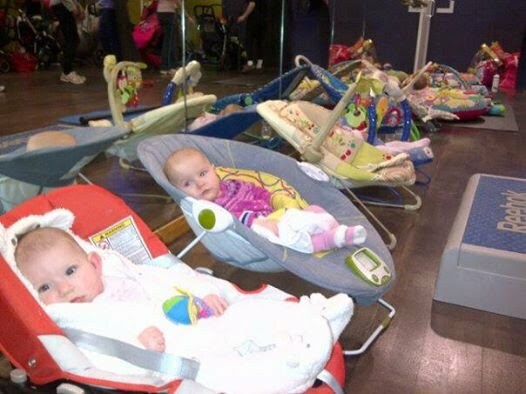 Babies are always welcome to join in and they love it! Bouncing on the ball - Who's enjoying it more? Strengthening core muscles can be fun for baby and mum! Comparing bumps - who's bump bigger? Meet other mums and make new friends for you and your baby! Hanging out - What a gang! Babies can play while mums workout..
Exercisin g all through the months of pregnancy had many benefits, not only to me, but to my family and my new born (5 kg) baby as well. I managed to sail through the pregnancy without having most of symptoms that are so common for most women. I arrived to labor feeling at my best, positive and confident, giving natural birth to my second child within 4 hours from my first contraction. We know that exercising while pregnant makes a huge difference in many aspects and caries verity of benefits. To learn more about why and how, please look into the attachments below.